As there is no physical drive in the new XBOX One S, most of the content will be served via digital XBOX platform and gaming store. The leaked images from where this rumour originates also indicates that the new gaming console will come with some pre installed games such as Minecraft, Forza Horizon 3 and Sea of Thieves. Till now we don’t have any info on the hardware feature set of this new console. 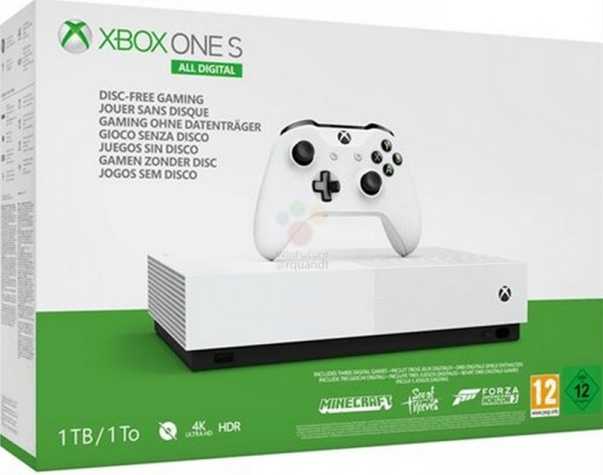 But the leaked outer images of the console box do indicate that the new All Digital gaming console from Microsoft will support 4K gaming and HDR features. Price is expected to be around 230 EURO and is expected to launched on 7th of May. But the main question is why has Microsoft decided to go with All Digital gaming console instead of the physical drive one.